The 3-D Burns prosthetic is a partial face prosthetic that creates the effect of burnt skin over half of your face. This prosthetic can be used for a number of different characters including The Phantom from "Phantom of the Opera." 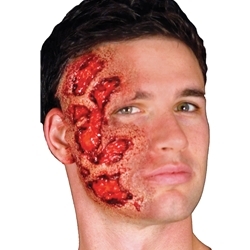 The 3-D Burns prosthetic application requires spirit gum or prosthetic adhesive to apply. The gory look of this prosthetic can be enhanced with the use of stage blood and a burn wheel.